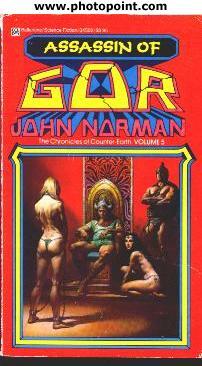 This Red Cover Assassin of Gor is probably a fluke. This ought to be a First Canadian Printing, and we're sure this printing exists, as it is referenced on the copyright pages of the Fifth Printing, Sixth Printing, Seventh Printing and Eighth Printing of the Ballantine Edition of Assassin of Gor as being published in January, 1973. However, according to this publication year, the cover should probably be a Ballantine Black Title Series, not a Ballantine Orange Cover Series. We still seraching for a better scan of this printing. The front cover scan is very bad, but this really looks like an Eighteenth Printing, which was simultaniously released in the USA and in Canada in November, 1986.